While exercising probably isn’t your top priority while on holiday, stand SUP yoga should definitely be the exception. Not only is this a unique activity, but you’ll be doing it during the most serene time of day: during sunrise. Take a break from partying and indulge in a bit of self-care and mental rejuvenation. Anybody can participate, even the most clumsy and uncoordinated are sure to have an amazing time! Experience Gili Trawangan at its finest: on the water during sunrise! 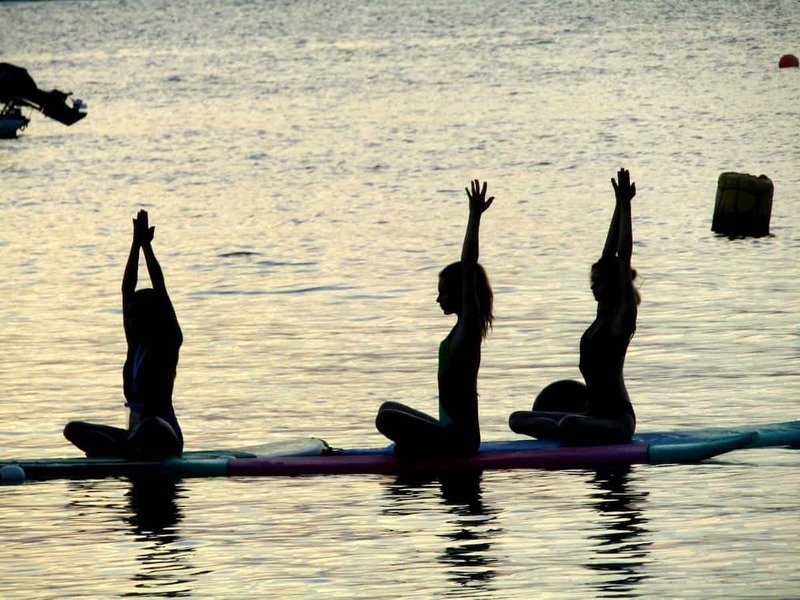 “SUP Yoga” is yoga on a stand up paddle board. We know what a lot of you are thinking: I can barely do yoga on solid ground, let alone on a paddle board. Fear not, the worst that can happen is falling into the water. SUP yoga is the perfect way to work on your balance and center yourself. Even the simplest postures can be challenging, and if you’re more advanced, you can attempt more difficult poses to deepen your yoga practice. You’ll get to the beach right before sunrise. With a view of Mt. Rinjani on Lombok, you’ll paddle out a bit from shore and tie up your paddle boards together with your fellow yogis. 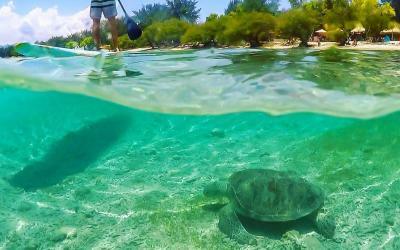 The water is perfectly clear with fish and the occasional sea turtle swimming below you. The yoga instructor will start the class off with some meditation and breathing activities while you soak in your surroundings. After getting more comfortable on the board, the class will continue with some simple poses. You’ll test your balance as you do basic positions like mountain pose and plank. Adding that extra element of balancing on water makes these poses a bit more challenging. 75 minutes of chatarangas and downward dogs later, you’ll end the class in savasana under the warm sun on the quiet water. If you’re a bit more experienced, you can practice some more difficult poses and try out inversions. You can even try acro yoga (acrobatic balances) or partner yoga (two people on one board doing various poses). If you’re all yoga-ed out, you can just paddle around or go for a dip. 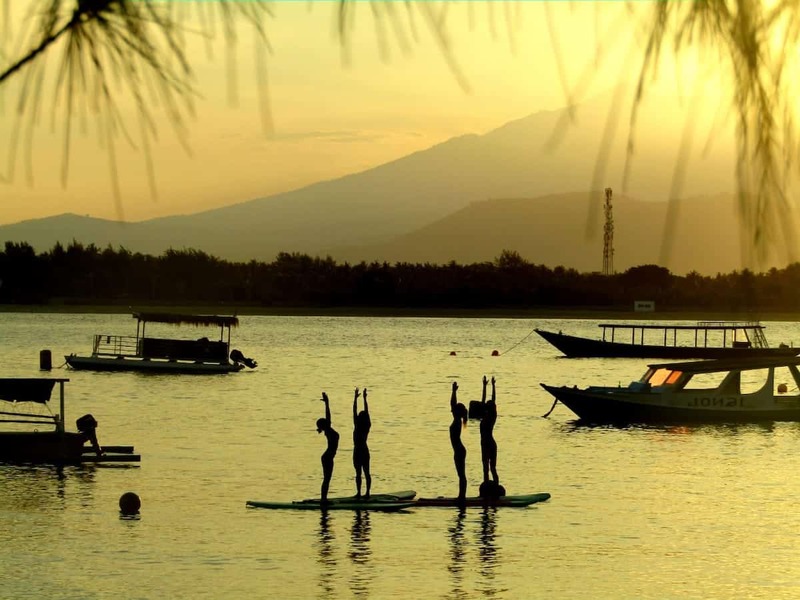 You can try out SUP YOGA at Fly Gili SUP Yoga, located on the east side of the island. SUP Yoga classes happen daily at 6am and you can also request to have a normal beach morning flow yoga class at 8:30 a.m. if you’re not quite ready to try out SUP yoga. It’s recommended to sign up a day in advance to ensure your spot! Prices are IDR 250,000 for SUP Yoga, which includes photos and a juice afterwards, and IDR 125,000 for the beach yoga class. Fly Gili SUP Yoga is conveniently located right in the center of the east side strip. 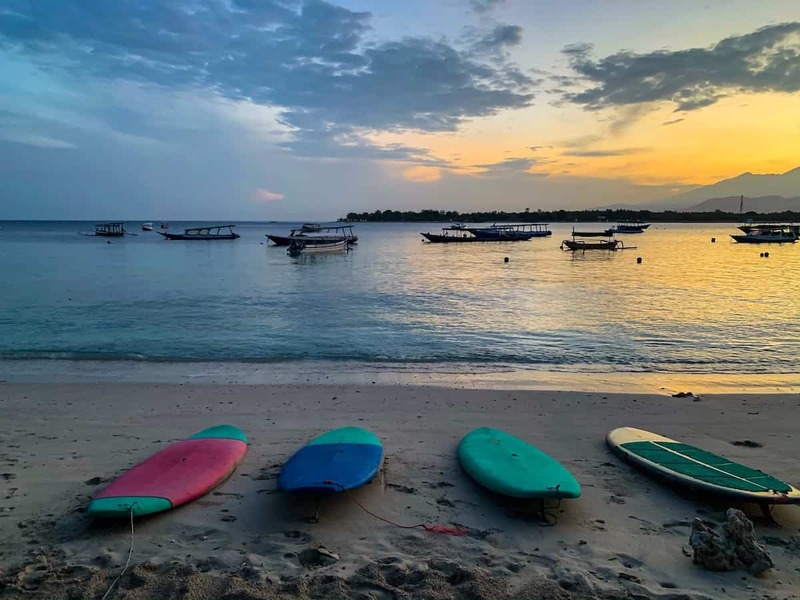 The same people also run Fly Gili Watersports if you’re looking to try out wakeboarding, water skiing, parasailing, subwinging (underwater “wings” that allow you to “fly” underwater as a boat tows you), tubing, or kayaking. 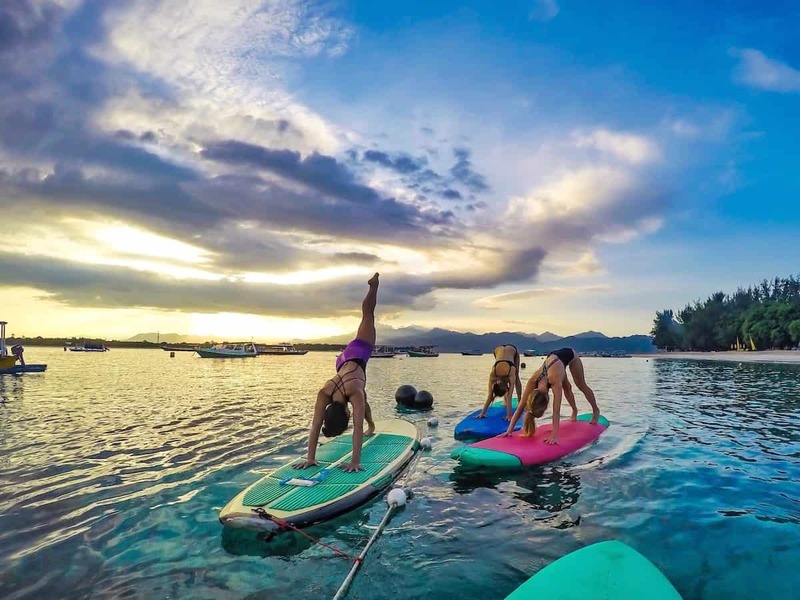 Experience Gili Trawangan at its finest with sunrise SUP yoga! Get your blood flowing, enjoy epic views of Lombok and Mt. Rinjani, and paddle around the crystal-clear water as the sun rises! You can get to Gili Trawangan from either Bali or Lombok. There are numerous options from Bali, but the most convenient way is to take the fast boat from Padang Bai. This is the quickest boat trip, taking about an hour and a half from Padang Bai Port to Gili Trawangan. You can book your ticket with any tour agency on the street or from your accommodation. This will usually include pickup (a van that will pick up around 10 travelers around Seminyak, Canggu and Kuta or Ubud) but you can arrange your own transportation if you want to get to the port quicker. 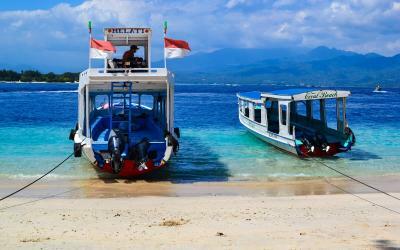 From Lombok, you can take the daily public boats or arrange a speed boat. 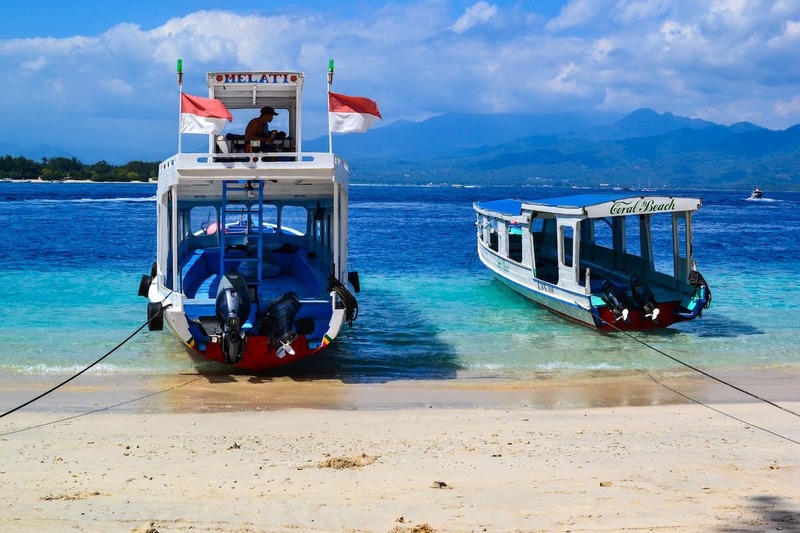 Read our full guide on how to get to Gili Trawangan here. 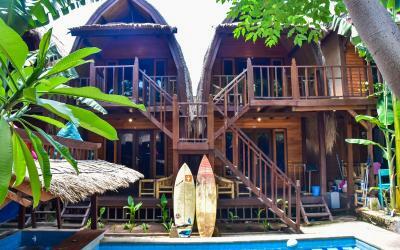 There are numerous types of accommodation options on Gili T. Stay in a resort or a traditional Indonesian bungalow. 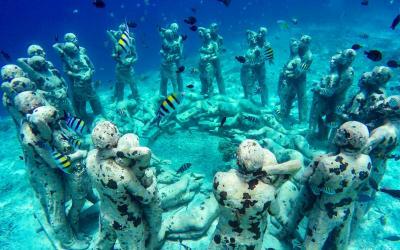 Gili T is famous for its party scene. 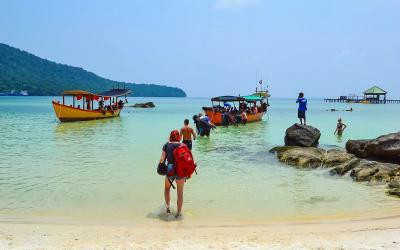 Backpackers have been coming to this little slice of paradise for years now to try those notorious shroom shakes, listen to live music, and party on the beach. 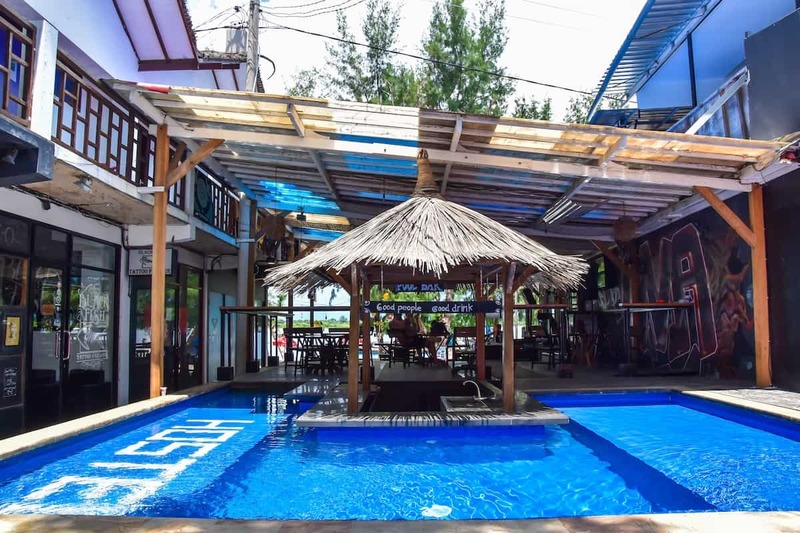 If you’re looking for a social scene to meet hundreds of other travelers, check out our list of the top backpacker hotels on Gili Trawangan. 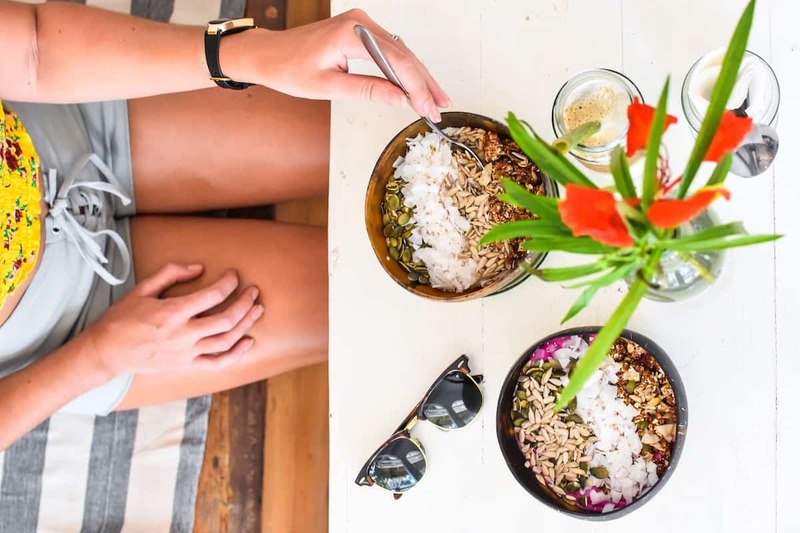 Dine on the beach with your toes in the sand, find a quaint cafe overlooking the water, or discover one of the hidden gems towards the center of the island. 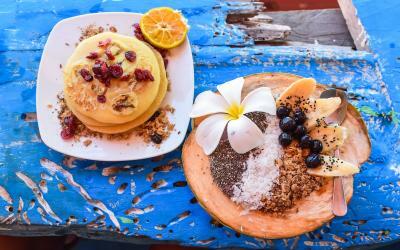 If you’re looking for the perfect spot to enjoy breakfast or brunch on Gili Trawangan, discover our favorites here. 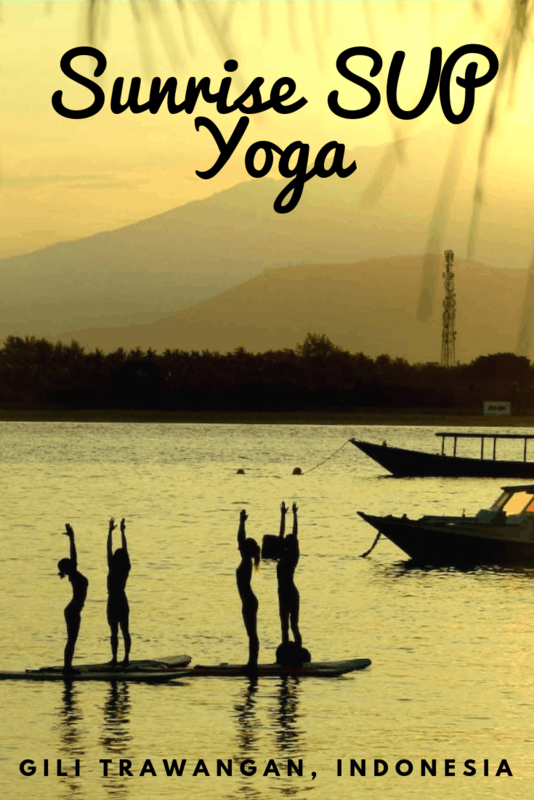 Did you find this article about SUP yoga on Gili Trawangan useful? If you’re looking for more unique activities to do on Gili T, check out these other articles we’ve rounded up to create the ultimate Gili Islands itinerary!